Wow. I don’t think I truly realized how long it’s been since The Vampire Diaries was working at its full insanity capacity until the last five minutes of this episode completely blew my mind. It’s so nice to know that even with all the show’s struggles this season, it still has the ability to shock and entertain at this high of a level. The Silas and the cure story has been a mixed bag of late, impressing one moment and then devolving into banality the next, but the resolution of it all is turning into classic TVD storytelling. Like the smart way the Silas story began as a background runner at the beginning of the season, the best part of tonight’s episode was introduced as an almost throwaway element ages ago, when the gang learned there was a mysterious additional party potentially searching for the cure. Since then, the show has cleverly placed little additional hints that someone else is on their tail, until it exploded tonight when the additional party was revealed to be none other than the inimitable Katherine Pierce. The instant Katherine showed up, it became clear exactly what this show has been missing since hunter Connor left the scene: a true bad guy. TVD has fallen into the trap of using Klaus as its de facto bad guy for every situation lately, and frankly, it’s gotten boring. Katherine—in all of her sarcastic, ruthless glory—was exactly what was needed to spice things up and add a new flavor of villain again. Especially because her presence leads to the most shocking thing since Elena was turned into a vampire: Jeremy’s (apparent) death. Yes, Jeremy is dead. Jeremy, Elena’s last living relative. Jeremy, Elena’s only real permanent tether to her childhood and humanity, was used by Katherine to feed Silas and wake him up so she could grab the cure and run, and Silas snapped Jeremy’s neck in the process. It’s a wonderfully written, choreographed, and directed scene, and the kind of thing that can only leave you sitting there in a state of shock as Jeremy’s lifeless body dropped to the ground in slow motion. Is Jeremy dead permanently? On this show, it’s never a certainty. There could always be a loophole. But that doesn’t take away from the power of the moment. This is what a real bad guy gets you: real, tangible consequences. Welcome back, Katherine. You have been missed. Katherine was obviously the highlight of the episode, but the entire framework that led to her reveal was very strong as well. TVD has an incredible ability to marry concurrent plot threads together in a kinetic, propulsive manner, and that ability was on full display here as all of the interested parties descended upon Silas’ grave. The most notable development this week was the revelation that the cure can only be used one time, therefore most everyone’s hopes were going to be dashed. This led to some great conversations about the meaning of the cure and who deserves to get it, with Elena finally taking a stand and realizing she will never be the girl she once was even if she does get the cure, so she makes the decision not to take it at all. The person they most want to give it to is Klaus, to protect themselves from his wrath over the death of Kol. Damon’s new hunter friend Vaughn has other plans, though. One of The Five, Vaughn knows the cure is buried with Silas for one reason only: to be used on him in order to kill him forever and prevent him from destroying everything. Vaughn is as ruthless as Connor was, without the added bit of insanity Connor seemed to supply. He’s all about getting things done no matter who or what is in the way, a philosophy that leads him to stab Bonnie in the back before she can raise Silas herself. This is a pity because before Bonnie is stabbed, she has quite the decent episode for herself. She is confident in her abilities and steadfast in her refusal to be controlled by Shane. Bonnie’s backbone only leads to her being stabbed in the back, however, another casualty in this supernatural war she’s always getting herself roped into. If I were her, I’d be telling my friends to find another witch willing to do their dirty work. The most emotional beat of the night beyond Jeremy’s death, though, was Caroline and Tyler’s tearful goodbye. 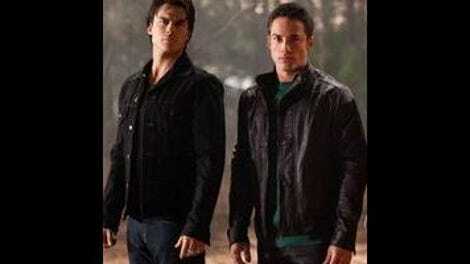 The second Tyler went against Klaus and broke the hybrids’ sire bonds, his story was inevitably leading to a moment like this, where he must either leave to escape Klaus or Klaus must die to free him. Caroline uses her connection with Klaus to give Tyler a little running room, and their subsequent goodbye feels permanent in a way Tyler’s departures haven’t before. Personally, I must admit I was so distracted by the possibility of Katherine’s return (and I haven’t been emotionally connected to Caroline and Tyler as a couple for quite a while) that this moment didn’t have quite the emotional weight I wanted it to, but it was gracefully written and well-acted by both Candice Accola and Michael Trevino. Tyler’s story never got to the point I wanted it to with the hybrids this season, but he quietly became one of the most dependable and moral characters on the show, and if this truly is the last we see of Tyler, he will be greatly missed. As for Jeremy, well, from the previews it looks like next week will be dealing with the aftermath of his death and likely Katherine’s return to put a kink in everyone’s plans. I honestly couldn’t be more excited to find out what happens next. Shane really did turn out to be a tragic figure, huh? Used by Silas and then trapped by his broken leg so he wasn’t even a part of the action at the grave. There are the beginnings of an interesting allegory about religious fanaticism here, but the writers didn’t go quite far enough to make the connections to have it really say something. Vaughn, like Connor, had very interesting vampire weapons. Stake grenade! Vervain zip ties! Jeremy really needs to get more creative. What was up with the “natives” Shane was using to help him? Bizarre and uncomfortable. Let’s play “Where was Matt?” I say he was out banging a bunch of sophomores because, hey, why shouldn’t he? The world might end!